Give Me My 21:9 Games! You’re looking at my primary monitor. It’s a Dell Ultrasharp U3415W. I use this for most of my daily work. Off to the side is an LG 4K display I use for occasional video or photography work, but the U3415W is my workhorse. I’ve been skeptical about these super wide-screen displays because they bring together two trends which I initially disliked: the 21:9 form factor itself, and the curved display. 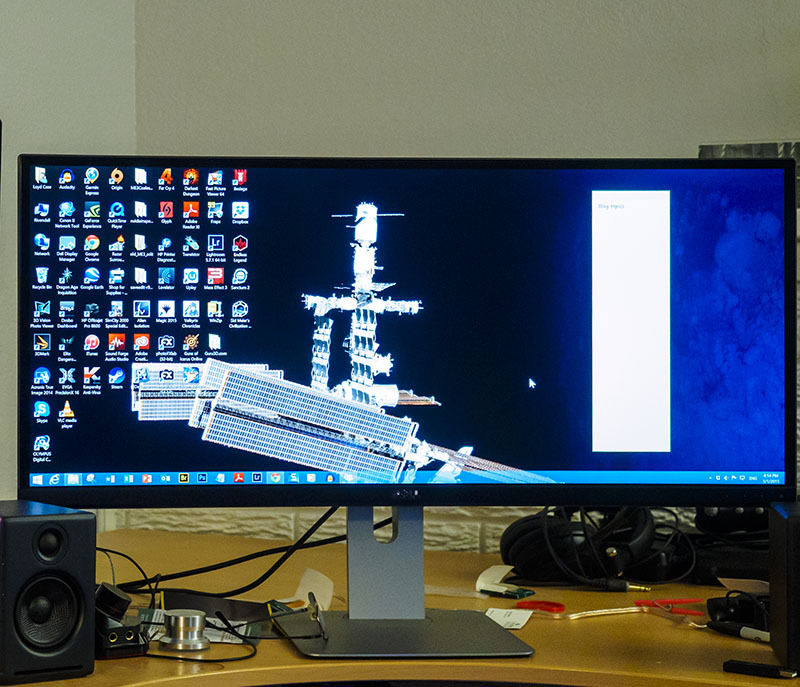 The first 21:9 monitors sold were flat screens, and looked like giant glass slabs. Curved displays didn’t work on HDTVs, catching glare coming from any direction. But mated together, these two initially unappealing features clicked together to create something much more positive. Displays like the U3415W and the LG34UC98-W also work well as displays, offering reasonably good color and grayscale fidelity. The Ultrasharp has become my go-to display for gaming as well. A game like Fallout 4, Dragon Age: Inquisition, or Assassin’s Creed: Syndicate look glorious in 21:9 ultra-wide screen. It may not be as immersive as a VR headset, but the gently curved, super-wide screen pulls you into the game. Dragon Age: Inquisition. Captured at 3440×1440; click for full size. However, quite a few games don’t support 21:9, and it’s irritating. I can forgive an older game like Mass Effect 3’s somewhat limited support. When a modern game doesn’t support this increasingly common aspect ratio, it’s annoying as hell. Fallout 4 is a good example: a AAA, recently shipped game in which you need to hack configuration files to enable 21:9. At least with Fallout 4, you can hack the config files. I recently bought Dragon’s Dogma: Dark Arisen off Steam, and the menus do not scale properly. The arcane UI in the menus makes changing resolutions impossible. I probably could have lived with running at 2560×1440 with letterboxing, but I couldn’t even make that setting work. So I returned it for a refund. To be sure, Dragon’s Dogma is an old console game ported to the PC, but when the publishers make a big deal about how great the PC port is, you’d expect a scalable UI and universal resolution support to be part of the package. The 21:9 aspect ratio isn’t going away soon. I’m seeing more of these displays, including versions targeted specifically for PC gamers. The gaming displays include features such as G-Sync or VESA Adaptive Sync. You’d think in the modern era, supporting multiple resolutions on PC games would be pretty simple, but it seems to be often overlooked. Game developers need to step up develop more ultra-wide screen friendly games.